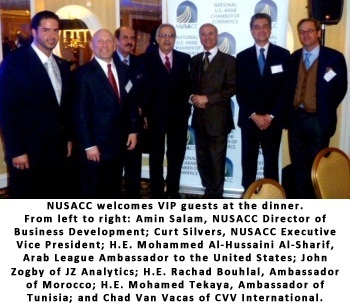 The National U.S.-Arab Chamber of Commerce (NUSACC) recently hosted John Zogby of JZ Analytics and Chad Van Vacas of CVV International at an exclusive roundtable dinner and discussion entitled “New Market Research and Polling Services and Analysis in North Africa.” Mr. Zogby and Mr. Van Vacas briefed attendees on new North African polling data and also delivered a special briefing on the 2012 Super Tuesday results. The roundtable drew over 40 business and government leaders from the United States and the Arab world, including H.E. Mohammed Al-Hussaini Al-Sharif, Ambassador of the Arab League; H.E. Rachad Bouhlal, Ambassador of Morocco; and, H.E. Mohamed Tekaya, Ambassador of Tunisia. Particularly after the events of the Arab Spring, North Africa boasts many dynamic and emerging markets, which present opportunities for companies to market their products and services to untapped consumer pockets of a burgeoning middle class throughout the MENA region. Furthermore, with more than 46 percent of the population of North Africa under 25 years of age, the region holds immense promise for the future. 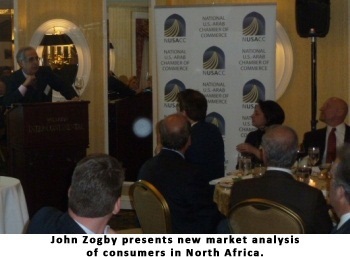 ​Zogby companies have over two decades of experience providing the highest quality market and opinion research in the region and new technologies have allowed the ability to master the collection and analysis of data. According to new research from the National U.S.-Arab Chamber of Commerce, these five nations comprise over 20 percent of the United States’ total goods exports to the entire Arab world. As the dust settles from events in Egypt and Libya, U.S. exports to these countries are expected to recover and, indeed, surpass pre-revolutionary figures.